Got lenses in search of a new body? Look no further! In-Camera Red-Eye Fix(TM)--automatically fixes most instances of red-eye in the camera. You may never see red-eye again! Face-Priority AF--Nikon's face-finding technology that automatically focuses on faces. D-Lighting--rescues dark or backlit images by improving brightness and detail where needed. 4 out of 5 stars - can't beat the price! From the manufacturer For the serious photographer, designer, and artist Intuos3 gives you the power to quickly and professionally edit photos and create digital artwork by turning on the full power of Adobe Photoshop, Corel Painter, and over 100 other leading software applications. Intuos3 tablets now put ExpressKeys and Touch Strips right at your fingertips for convenient keyboard shortcuts, scrolling, zooming, brush size control, and more. And if you're using a widescreen display or multiple monitors, the new Intuos3 4x6, 6x11 and 12x19 are designed just for you. Wacom's Penabled technology gives you the natural feel and superior performance of Wacom's patented cordless and battery-free tablet technology. You'll find that using an Intuos pen, mouse, and tablet gives you more control, comfort, and productivity. Alternating between the comfortable Grip Pen and the ergonomic five-button Intuos3 mouse reduces repetitive motion. It's an easy and natural way to work. Have you been wanting to upgrade your network to 802.11n but thought it was too expensive? Well now's your chance to go for it. 40 bucks is a smokin' deal! Starting at 4GB, microSDHC cards offer higher storage along with the versatily of transforming the card into a miniSDHC or full-size SDHC card. Kingstons microSDHC cards use the new speed class rating of Class 4 that guarantee a minimum data transfer rate of 4MB/sec. for optimum performance with devices that use microSDHC. The PMP-3520 20 GB Portable Media and MP3 Player with Video Recorder 3.5" Screen from Coby is a portable media player with a 3.5" LCD screen, video recording, SD memory expansion slot, an integrated speaker and 20 GB of internal storage. The player can input and output video and audio using standard A/V connections, allowing you to use it as a handheld device or to connect it to a home theatre for playback or recording. It also plays back all standard computer video formats, MP3 music and digital camera images. This is a great solution for anyone looking for a portable personal media player. Remember a few years when you shelled out 70 bucks just for a 1GB flash drive? Well, it's time to kick yourself and make yourself feel better at the same time when buy this great drive at a greater price. You can't go wrong with this one! This is true high-performance versatility. You'll quickly print photos with color resolution up to 4800 x 1200 color dpi; a borderless 4" x 6" photo takes only about 46 seconds. The Automatic Document Feeder (ADF) holds up to 30 originals, so it's much easier to copy, scan or fax large documents. Copies will be remarkably true to the originals, and documents will feature bold, laser-quality text. You'll produce 1200-dpi scans with vibrant 48-bit color depth, and achieve Super G3 fax speed in color and B&W. High resolution: Precision ink nozzles create high resolution photosup to 4800 x 1200 color dpi. Impressive color and text: Three color inks plus a pigment black ink produce impressive photos and laser-like text. 4" x 6" Photo: Borderless 4"x 6" photo in approx. 46 seconds. Superb scanning: Produce beautiful scans up to 2400 x 4800 dpi with vibrant 48-bit color depth. Handles big jobs: The automatic document feeder holds 30 originals, making it easier to copy, scan or fax large documents. Auto-Image Fix: Enrich your photos with new Auto-Image Fix, and faithfully reproduce photo and document quality with advanced copy technology. Memory Card: The memory card slot lets you print photos direct. No computer needed! Plug into a Network: The Ethernet interface lets you establish or connect to a home or office network. Take your PENTAX Optio W60 to new extremes. With 10 megapixels and a 5X internal zoom, this waterproof Optio shoots deeper, wider and at colder temps. A new design allows the Optio W60 to operate up to 13 feet underwater for two hours and at extreme temperatures well below freezing. Perfect for photography in adventurous settings, the Optio W60 captures a wide variety of scenes including expansive landscapes, architecture, and group photos in confined spaces as well as close-up telephoto shots. Available in Ocean Blue or Silver, the Optio W60 also feature High-Quality Movie mode, Face Recognition, Smile Capture, and Blink Detection. 10 Megapixels for large, detailed images. 5X optical zoom in a slim 1 inch body is equivalent to 28-140mm. Wide angle 28mm zoom lens ideal for landscape, indoor, or group photos. Waterproof to 4m (13 feet) protects from rain and spills, as well as allowing underwater photos and video. 2.5 inch IPS (In Plane Switching) LCD monitor with Anti-Reflective coating is viewable at wide angles, even in bright sunlight. Coldproof for use in extreme, sub-zero temperatures. HD movie capture to vividly capture moving memories in widescreen 720p. Advanced Face Recognition technology sees up to 32 faces in 0.03 seconds, with Smile Capture and Blink Detection. PENTAX Shake Reduction system automatically sets ISO up to a high 6400 to prevent subject blur. Movie Shake Reduction also available. Close focusing, Super Macro mode brings out the details in even the smallest subjects as close as 1 cm. Nikon's Coolpix L18 features 8.0 Megapixels for stunning prints as large as 16 x 20 inches, 3x Optical Zoom-NIKKOR Glass Lens gets you close to the action, Anti-Shake Mode minimizes the effect of camera shake, and much more. 8.0 Megapixels for stunning prints as large as 16 x 20 inches. Anti-Shake Mode minimizes the effect of camera shake. Huge, Bright High Resolution 3.0-inch LCD makes it easy to view and share pictures. Now that the D90 is on the market the very capable D80 can be had for a bargain price. Probably the best portable photo album around (besides the iPhone). Buy it here for less than at the Apple Store. Insane price for a high-speed 16GB SDHC card! $200 off on this excellent camera!! AMAZING DEAL! Fusing 12.3-megapixel image quality and a cinematic 24fps D-Movie Mode, the Nikon D90 exceeds the demands of passionate photographers. Combined with fast 0.15ms power-up and split-second 65ms shooting lag, dramatic action and decisive moments are captured easily. Record cinematic-quality movie clips at up to 720p HD (1280 x 720 pixels) in Motion JPEG format, enhanced by NIKKOR interchangeable Lens quality and versatility. High signal-to-noise components and design deliver exceptional performance, even at high ISO setting from 200 to 3200. High resolution, 170-degree wide-angle viewing guarantees confident image review and movie playback on a 3" super-density 920,000-dot Color LCD monitor. Effective built-in, 4-frequency, ultrasonic image sensor cleaning frees image degrading dust particles from the sensor's optical low pass filter. The 11-point AF system with Face Priority consistently delivers fast and accurate autofocus, reinforced by the Nikon Scene Recognition System in a wide variety of conditions. Easy to use Live View activates access to 3 contrast detection focus modes including Face Priority AF. 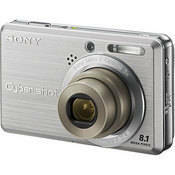 The Sony Cyber-shot DSC-S780 Digital Camera is a sleek and compact camera with 8.1 megapixel resolution, a 3x optical zoom lens, high ISO 1250 sensitivity for low-light shooting and Stamina Battery Power which provides extended battery life and shooting capacity when using fresh AA-sized batteries. The bright 2.5" LCD screen makes it easy to frame your shots and view your images. It has 22MB of internal memory so you can shoot pictures and video clips with your camera right away, or you can purchase an optional Memory Stick Duo media card to expand your shooting capability. The DSC-S780 is also very easy to use with convenient scene modes and fully automated shooting features. 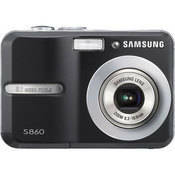 The Samsung S860 Digital Camera is a user friendly point and-shoot digital camera with a compact and stylish design that features 8.1 megapixel resolution combined with a sharp 3x zoom SHD lens for stunning pictures. The camera also provides a number of useful features including Digital Image Stabilization (DIS) to help minimize the effect of camera shake and produce sharp, clear images, especially in low-light environments. Advanced automated features such as Face Detection, which can locate up to nine faces in a frame and automatically optimize focus and exposure to ensure best overall portrait and group shots possible. And the Self Portrait mode, which uses face detection to make taking self-portraits easier. Did you know that this new generation makes a great portable photo album? This 16GB is $25 less than if you buy from Apple direct. Great deal!! 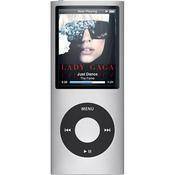 The Apple iPod nano 4th Gen 16GB expands your media horizons with its video playback capabilities in a super slim 6.2mm aluminum chassis. Watch your videos on the super bright 320 x 240 resolution screen that has an amazing 204 pixels per inch. 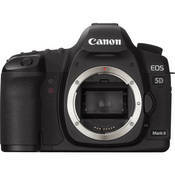 The Canon EOS 5D Mark II improves upon the EOS 5D by increasing the resolution by about 40% to 21.1 Megapixels and adds a Live View feature that allows users to preview shots on the cameras High resolution 3.0" LCD display. It even incorporates the ability to record full motion HD Video with sound, so you can capture the action as well as superb images. The Canon EOS 5D Mark II incorporates a high-fidelity (920,000 dot) 3" LCD screen and includes a 'Live View' feature that permits the user to frame their shots on the LCD display, and adds framing functions that are not possible with a traditional SLR viewfinder including the ability to zoom in and navigate the preview image to ensure proper focus, and a grid overlay to assist in proper composition. The Live View focusing system also enables focus modes such as Quick mode, Live mode and Face Detection Live mode. Furthermore, the Live View Feature enables HD video recording that can capture true HD-quality (1080p) video at a frame rate of 30 fps with Face Detection and sound. Nikon's Coolpix 550 features 10.0 Megapixels for stunning prints as large as 16 x 20 inches, 5x Optical Zoom-NIKKOR Glass Lens, Electronic VR Image Stabilization minimizes the effect of camera shake, and much more. Includes 4GB SDHC. Price includes $150 instant rebate. Add coupon LOYALTY10 to bring the price under $500 with 2 lenses! That's incredible!! USB 2.0 -- For convenience and compatibility among multiple computers. Combine a beautiful new gloss-black case that fits smoothly in your hand and pocket with mega-capacity for all your digital content and the worlds most popular portable drive just got better than ever. This compact drive fits easily in your pocket or purse, weighs only a few ounces and with capacities up to 320 GB, you can take tons of photos, videos, files and music with you wherever you go. Selling rapidly - get them while you can!! Incredible price for this compact camera! Smokin' deal on this refurbished unit! It's not every day you can get a 17" fully loaded laptop for 6 bills! Update: Abe's extended this deal until the end of the rebate, ie. 1/17/09 - plus, they've added a CF card! You MUST USE promotion code DS15X! Abe's of Maine's incredible Sandisk memory cards rebate rolls on for its final weekend, and they're dropping prices through Sunday to make incredible deals for THIS WEEKEND ONLY. The rebate is good on many memory cards, but these two deals are impossible to pass up. These prices will be active on Friday, Saturday and Sunday, 1/9-1/11. Make sure you add both promotion codes! DS15X will remove $15 off each line item, LOYALTY10 will take off $10 from the total. You will need this rebate form! Designed for professional-looking, yet easy and creative shooting, plus high-performance in low-light conditions; the DMC-LX3 features an F2.0 24mm LEICA DC Vario-Summicron lens, 10.1 Megapixels resolution, and an ultra-sensitive 1/1.63" CCD developed specifically for this model. By combining a high-quality lens and sensor ready for a variety of shooting conditions with a wide-range of accessories and manual controls, the DMC-LX3 is ideal for professional photographers and serious amateurs looking for a compact Digital camera that furthers their creative photography. The DMC-LX3 is the F2.0 24mm ultra wide-angle Leica DC Vario-Summicron lens is about twice as bright as a F2.8 lens and can shoot at higher shutter speeds to capture clear, blur-free images in dimly lit environments. The DMC-LX3 features a Film mode with six Color types and three types of Monochrome selections. Much like selecting from different film types, this function gives you the flexibility and creative freedom to take more expressive digital photos. That's about $100 less than anywhere else!!! This compact machine is your new mobile photo lab, printing photos anywhere you want. You'll create beautiful, detailed photos up to 5" x 7", with print resolution of up to 9600 x 2400 color dpi. A 4" x 6" borderless photo takes only about 39 seconds, and the unique Easy-Scroll Wheel makes operation a breeze. You can print photos directly from memory cards, using the high-resolution 2.5" TFT display to preview images. Or, print photos directly from your digital camera or your camera phone - wherever you are. It''s the perfect companion for parties, vacations and family events.